The polish that never sleeps! The Corrupted Neon collection brings you the zestiest neon shades, style your look by sprinkling glitter over wet polish for a sizzling finish. As the sun sets, light up the night with the black light topcoat ? clear on application, this clever polish glows under UV lights. Warning: this product is sure to attract attention! 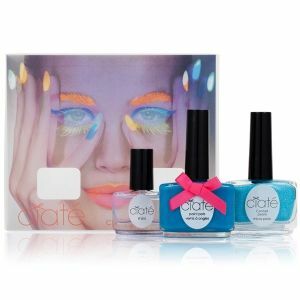 Begin with a base coat to clean dry nails, we'd recommend Ciaté Underwear. Paint two thin coats of the neon Paint Pot for a full coverage colour hit. Next, style your look! Sprinkle neon glitter to a wet nail, no need for to seal in with a top coat this look is raw glitter finish. Apply the black light topcoat to dry nails and allow to dry. Find a UV light spot and get ready to glow!